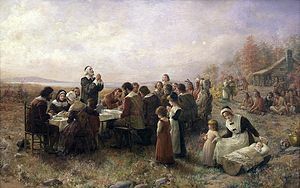 With the Thanksgiving holiday upon us, I have contemplated this question: Is Thanksgiving really supposed to be happy? I mean, if we have some unhappy circumstances during the Thanksgiving holiday, does it make Thanksgiving a null and void holiday? I guess it could…if we think we must be “happy” in life to be thankful in life. But what if to the contrary, Thanksgiving is really about giving thanks to God for our life regardless of our happy or unhappy circumstances in life? Is this what a Happy Thanksgiving really all about and is it even possible? I believe this is exactly what Thanksgiving is all about and I further believe that it is completely possible because the Apostle Paul writes in 1 Thessalonians 5:18, “in everything give thanks; for this is the will of God in Christ Jesus for you.” This means that in everything – every situation, happy or not – you and I can still give thanks to God. Wow! As the magnitude of this thought sets in, I personally understand that this can be a difficult thing to do when we are experiencing some significant trials in life; however, as a follower of Christ, I am assured in Romans 8:28 “that all things work together for good to those who love God, to those who are the called according to His purpose.” Because God promises me that He will work all things together – the good, the bad, and the ugly circumstances in my life – for my good, I can rejoice in knowing that I am not in any way subject to my circumstances. In fact, I like the way Webster defines circumstance as a subordinate or accessory fact or detail because that definition affirms that my circumstances in life are simply subordinate details in my life. So you might ask, “subordinate details to what in life?” The truth in Romans 8:28 clearly indicates that our circumstances in life are totally subordinate to the Lord and His greater purpose for our lives. In other words, circumstances change; God and His word never change; therefore, our circumstances in life are subordinate to God and His word, the Author and Finisher of our faith. Our circumstances in life must and will change to line-up with God and His never changing promises for our life when we believe Him and His word. This is the reason we can give thanks in everything – not for everything, but in everything. In Christ, we are not subject to any circumstance in life and that is ample reason to give thanks in everything! Without question, the Lord has the last word in everything and He will be faithful to work all things together for our good and His glory! So let us be encouraged today and everyday to really give thanks to God in everything so that we can truly have a Happy Thanksgiving everyday! A Happy Thanksgiving, Really? Copyright2012, The Make It Happen Learning Institute. You have permission to reprint the leadership article, A Happy Thanksgiving, Really?, in its entirety only, and forward to your colleagues and friends, provided the copyright notice remains part of the reprint and transmission. All other rights reserved.